The music lineup, along with food and beverage highlights have been announced for the third annual Monster Energy Rock Allegiance, Saturday, October 7 at the festival's new location at BB&T Pavilion and Wiggins Waterfront Park in Camden, NJ. The Northeast's biggest rock experience will feature over 20 bands on three stages, along with mouth-watering, Philly-centric food offerings, regional and national craft beer, band meet-and-greets, autograph signings, and more for fans from around the country to immerse themselves in rock and roll culture. 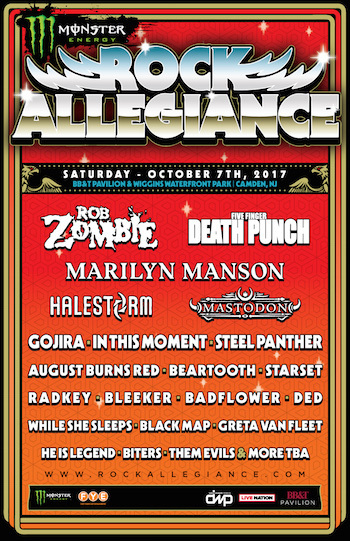 Zoltan Bathory of Five Finger Death Punch said, "Rock Allegiance has become a staple on the U.S. festival circuit. It's one of the coolest festivals out there for fans to discover new music and see their favorite bands live. We are excited to return this year to see our friends and fans in Philly. Don't miss it! It will be another great one this year." Lzzy Hale of Halestorm commented, "We are so excited about being a part of Rock Allegiance 2017! We've been busy writing new music for our next record and have been missing the stage. We cannot wait to see all of you and give a loud offering to the Rock N Roll gods!!" Tickets for Monster Energy Rock Allegiance will go on sale Wednesday, May 24 at Noon ET at www.RockAllegiance.com and www.LiveNation.com. See below for ticket purchase options. Monster Energy Rock Allegiance is proud to support beer entrepreneurship with a celebration of local breweries and specialty drafts hailing from throughout the nation. 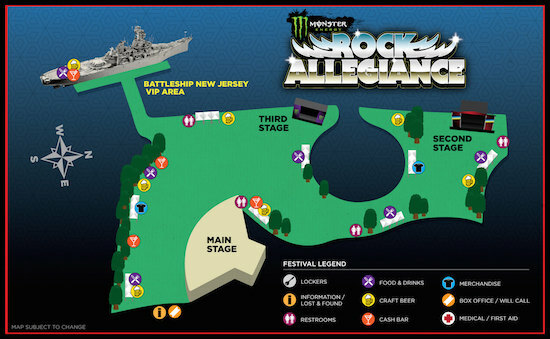 The initial lineup of regional and national craft beers at Monster Energy Rock Allegiance is as follows: 21st Amendment (San Francisco, CA), Dogfish Head (Milton, DE), Founders (Grand Rapids, MI), Neshaminy Creek (Croydon, PA), Oskar Blues (Longmont, CO), Spellbound (Mount Holly, NJ), Tröegs Independent Brewing (Hershey, PA), Unibroue (Chambly, QC), and Victory Brewing Company (Downington, PA). The initial food lineup for the festival includes: Baby Blues BBQ, Chickies & Pete's, Nico's Pizza and More!, Sum Pig Food Truck, The Cow and The Curd, Trent's Treats, with many more to be announced. "We are honored to be working with DWP again as we welcome Rock Allegiance back to the area for its third year," said Geoff Gordon, Live Nation Philadelphia Regional President. "And we couldn't be happier that they chose BB&T Pavilion and the Delaware River Waterfront as the festival's new home." Exclusive VIP restrooms, special food and beverage offerings (for additional purchase), and exclusive VIP Afterparty on the Battleship New Jersey (space limited). During the first portion of the festival, all seating will be general admission. For the headlining four bands, the Main Stage / Pavilion will be assigned seating based on the ticket purchased. Discounted online hotel rates are also available through Curadora. Visit www.RockAllegiance.com for details. The festival is fueled by Monster Energy. Additional sponsors include FYE, Roadrunner Records, Razor & Tie, Century Media and Another Century, with more to be announced soon.